MEMPHIS, Tenn. - July 24, 2018 - PRLog -- "Timothy, The Shooting Star" is the first book in the Savanna Tales series by educator Dr. Christie Elam. Her series will focus on the unique and sometimes challenging behaviors of children with emotional or behavioral disorders. 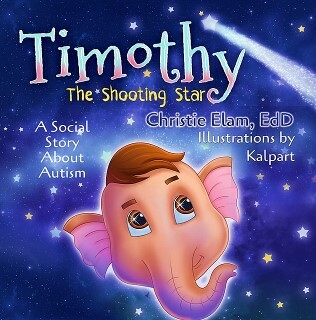 "I pray that the book will be used as a tool to connect to children who understand Timothy and can learn that they are a unique and special creation, despite their differences," the author says. The goal is to help kids connect to the book's characters in a way that will embrace their differences, while celebrating the strengths that make them exceptional individuals. Timothy, an elephant with autism, is very uncomfortable around others. Loud noises and social situations make him cringe. The challenges of having autism cause him to shake his trunk back and forth to soothe his anxiety. But all his shaking makes others tease him and laugh. Timothy loves to look up into the sky. One night, a shooting star changes everything for him! See how one elephant discovers his own worth and gains the respect of others. About the Author: Christie Elam, Ed.D., has served in the public school system for over 16 years. She is currently the president and consultant for Hannah's Child Educational Consulting, Inc., and is director of the Horizons Program at Tipton Christian Academy. She has a great passion for working with children, especially those needing a little extra support. Dr. Elam is a pastor's wife. They have two daughters and live in Brighton, Tennessee. "This meaningful children's story teaches many lessons to young readers about autism. We are very proud to announce its release," said Robert Fletcher, CEO of Strategic Book Publishing and Rights Agency. http://sbprabooks.com/ChristieElam or at www.amazon.com or www.barnesandnoble.com. "An Island Entire Unto Itself: A Portrait of Corsica at the End of the 18th Century"
"That Guy What Kill Topsy: With sixteen more stories, including the novella "I ♥ Rhinos"